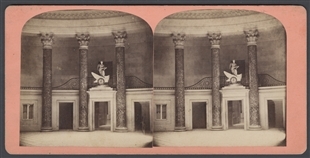 The plaster cast of the statue of Freedom—the bronze version of which surmounts the Capitol dome—figures prominently in this stereoview of Statuary Hall. 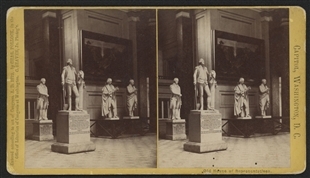 The 19th-century Freedom was imagined as a female warrior with an eagle feather headdress, a sword, and a stars-and-stripes shield. 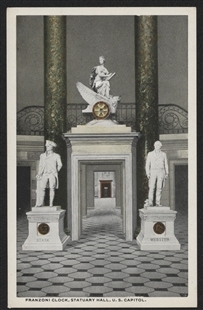 This space, which served as the House Chamber from 1819 until 1857, became National Statuary Hall in 1864.